1961 Mercury M-100 | Monster Merc! Everyone knows the tale of Dr. Frankenstein and his monster: maniacal laughs, lightning strikes, comically huge switches being flipped and green skin. What might not be as familiar is Dr. Frankenstein’s less nefarious motivation; he was inspired to learn and create, to pull life from the jaws of death. 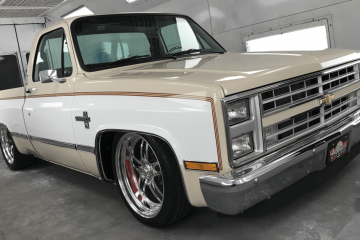 To anyone with experience resurrecting classic trucks, this doesn’t sound all that insane. For Trevor Dykstra, it was just another day in the life. 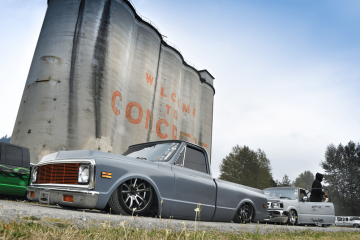 Since high school, the British Columbian has had a fascination with classic vehicles and past endeavors have been spent on a ’33 Ford truck and a ’49 Ford two door. 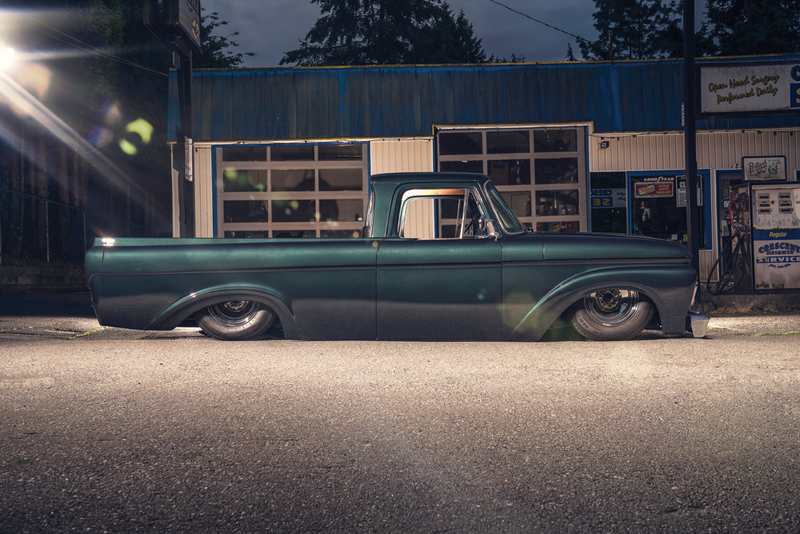 In 2014 Trevor acquired his ’61 Mercury M-100, a Canada-only variant of the F-100. The chance to build a Monster Mercury of his own was something Trevor, like Dr. Frankenstein, simply could not resist. The Monster Merc uses a collection of OEM suspension components, each borrowed from other Ford Motor Co. variants. The M-100 platform is no more than a rebadged and branded F-100. In 1946, Ford Canada restructured some of its sales tactics, and part of its strategy included introducing pickups into the Mercury lineup. The M series trucks closely followed their Ford cousins, varying only slightly in matters of appearance. 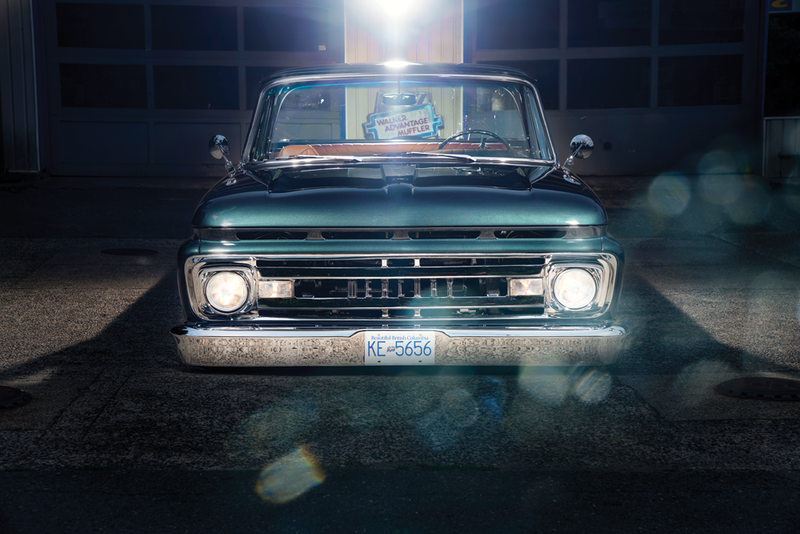 The parallel production continued in the Canadian market through 1968, including the infamous unibodies of 1961-63. 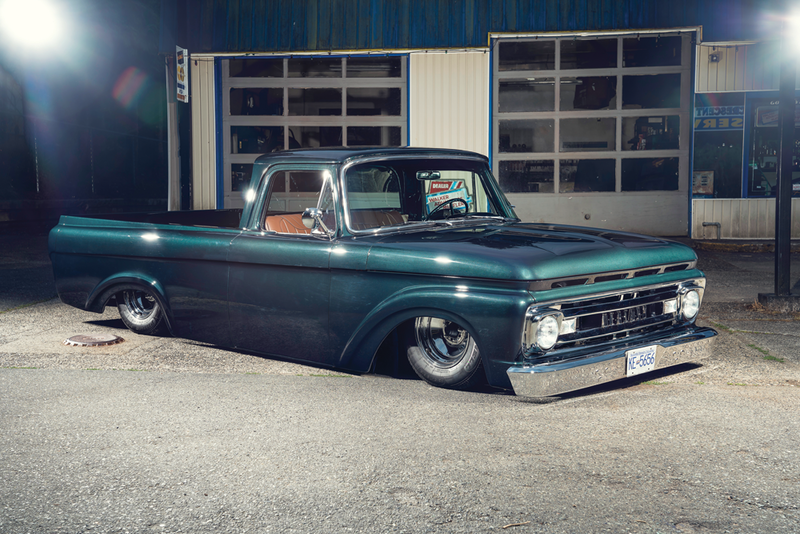 Ford has continued to shuffle the production deck throughout the decades. Ford of Canada, Ford in Europe and Ford in Mexico have all had their unique distinctions. Several sub-brands have spent their lives under the Ford umbrella, while others have changed hands all together. Thanks to the overlaps in engineering, Trevor was able to adapt multiple OE models to his build. The end result is a beautifully monstrous homologation that brought his vision to life. The front of the Merc uses a grafted clip from a Jaguar S-Type. Between 1989 and 2007, Jaguar was an extension of Ford Motor Co. The use of the sedan’s front clip gave Trevor’s Monster a much-needed update to the driving experience. Built for daily use, the ’61 now drives like a dreamboat. Trevor also notes that the use of the Jaguar clip, as opposed to a Crown Victoria or Mustang II, allowed him to eliminate excessive negative camber when fully aired out. Using the sedan front suspension required Trevor to raise it slightly and fabricate a custom cross member. In the rear, the chassis has been notched to accommodate the adapted Ford Explorer suspension. The 8.8 rearend sports a triangulated 4-link configuration, which promotes a smoother ride at any height, as well as greater articulation when laying frame. The final suspension composition is a sum of a Mercury unibody, Jaguar front clip and Ford rearend. 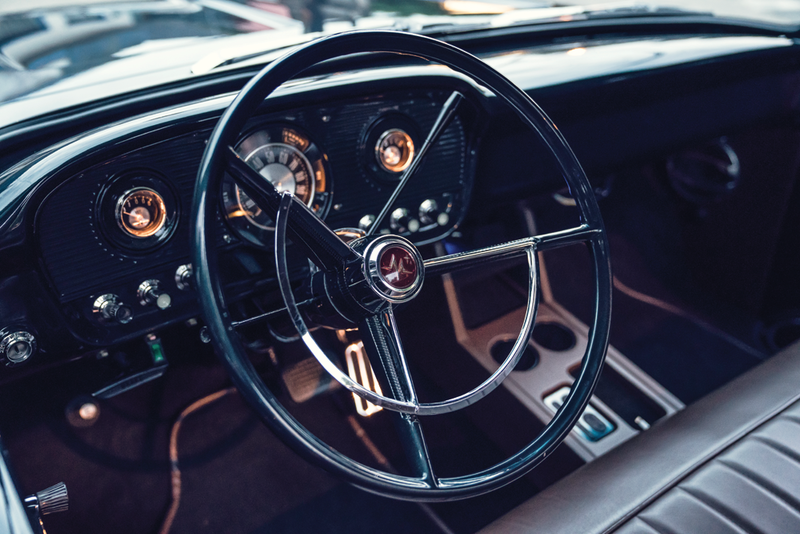 The retention of OEM components keeps costs down while maintaining serviceability and also lends itself to a smooth driving experience, having the factory engineering to back it up. All of the suspension bits were cleaned and powdercoated for a like-new installation. The primary modification comes via Slam Specialties 6-inch airbags at each corner. The air system is managed with AccuAir’s E-level and kept afloat with dual 400 VIAIR compressors. Trevor notes that M-100s are rare enough in their own right, the unibody years are even more elusive, and one so heavily modified is practically unheard of. For the powertrain, Trevor kept it in the Ford family, opting to go Five-O. 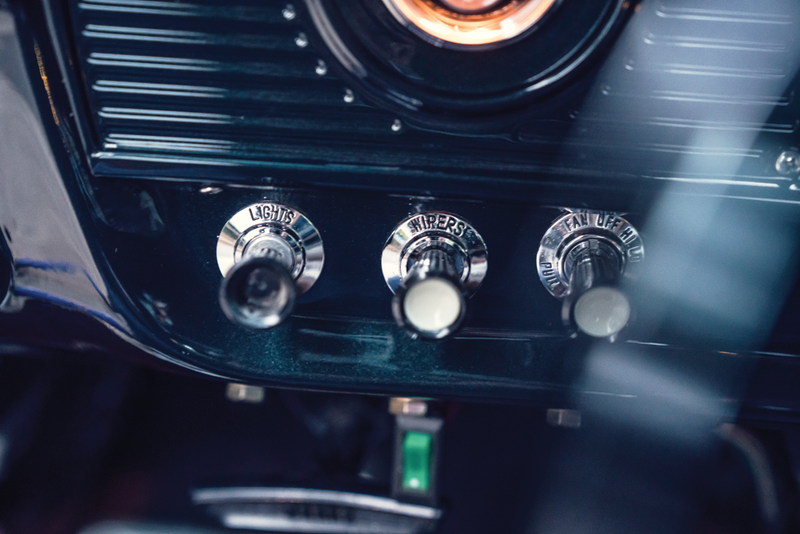 The fuel-injected V-8 is mated to a rebuilt automatic transmission. Having already fabricated a custom cross member, motor mounts were certainly worth the effort for a few more liters. The 5.0 roars through a set of custom stainless-steel headers and out through twin Magnaflow mufflers. Along with the stout 8.8-inch rear, the Monster Merc received OEM front and rear disc brakes. The modern braking abilities do plenty to quell the V-8 and further add to the pleasurable daily driving experience. The steelie wheels are currently serving as a mockup until Trevor settles on a final set. 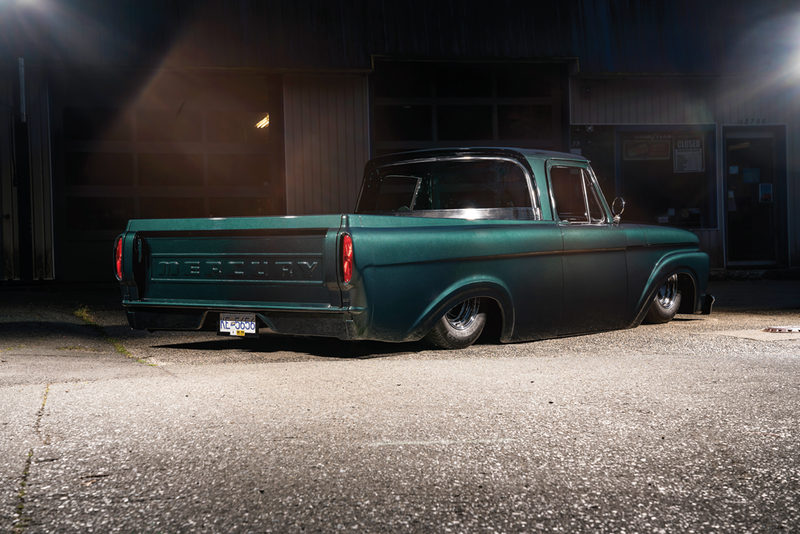 For the time being, however, they lend themselves to a classic, period-correct look beneath the big body style. 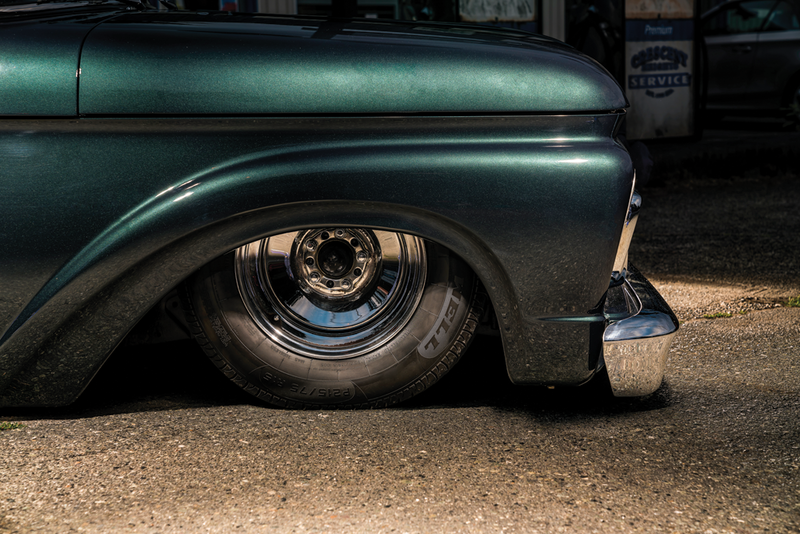 The juxtaposition of the classic 15-inch wheels and the pavement-scraping stance make for a dramatic, pavement-crushing look. The primary mod—the roof chop—adds further drama. The M-100’s cab is chopped just south of 2 inches. 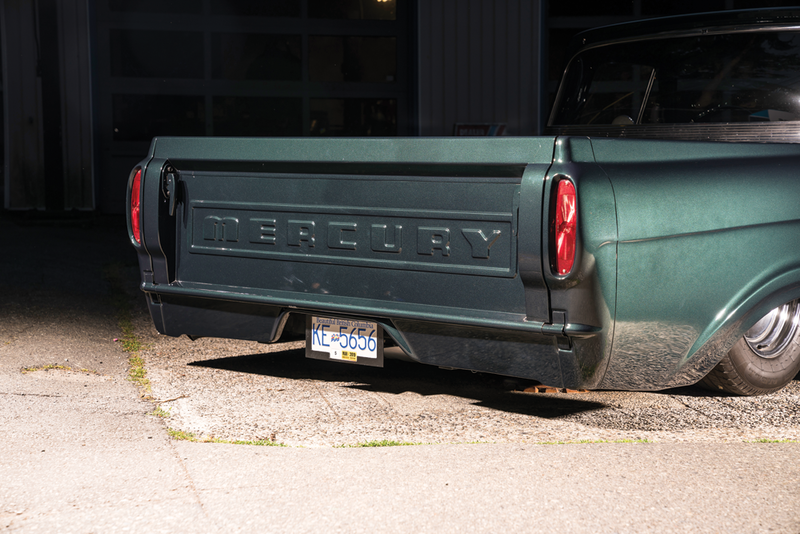 The truck’s altered proportions are pleasing, and the custom impact is instantly noticeable. Chopping the roof also afforded Trevor the opportunity to learn a new skill, laminated glass cutting. Learning and developing skills is his primary motivation with his hobby of choice. Continuing the customizations, Trevor opted to shave just about everything on the exterior. The gas filler, cowl, door handles, etc. have all been shaved and smoothed. The bed floor is a custom-molded unit borrowed from a Chevy long-bed (it just happened to work out). After the extensive bodywork was completed, Trevor applied three coats of primer before sending the truck out for paint. The color is a gorgeous BMW Deep Green Metallic. For those particularly interested in the M-100/F-100 history and distinctions, you’ll know that badging is everything. 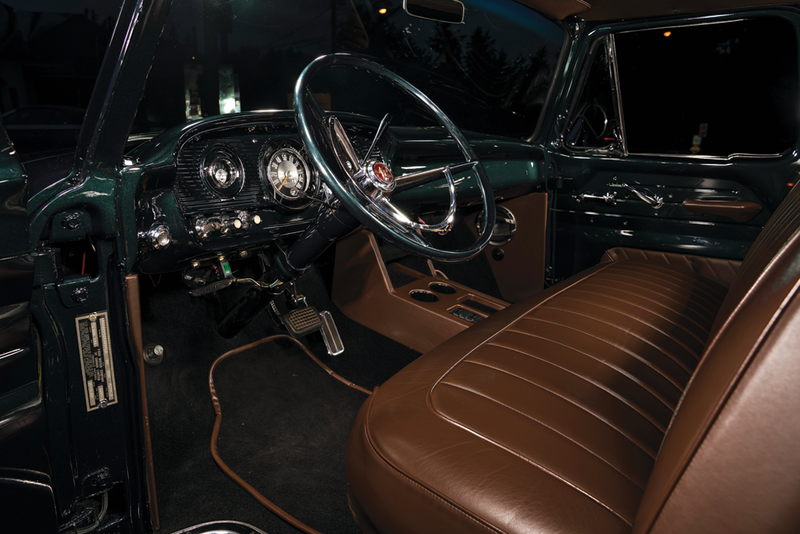 The original Mercury trim, interior horn ring, badges and bumpers have all been preserved and re-chromed. The interior has been modestly cleaned up and restored, much like the exterior. 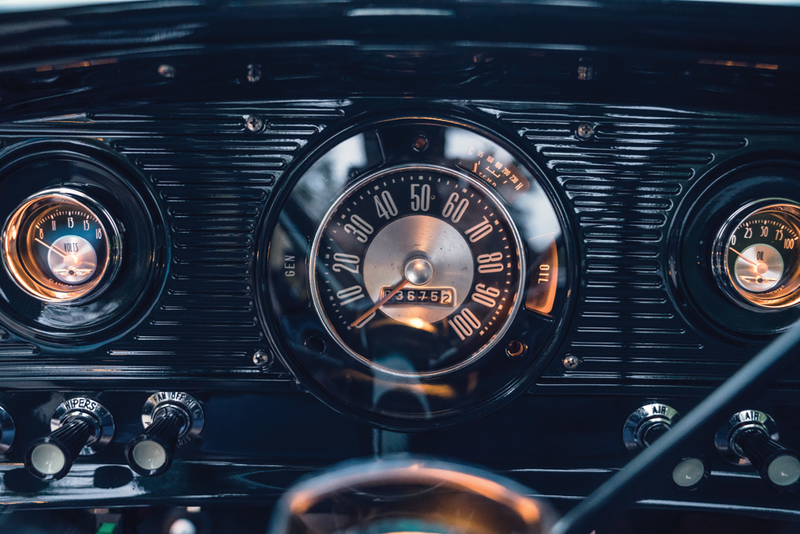 Trevor extended the shaving and smoothing process to the dash, which was paint-matched and outfitted with its original instrumentation. 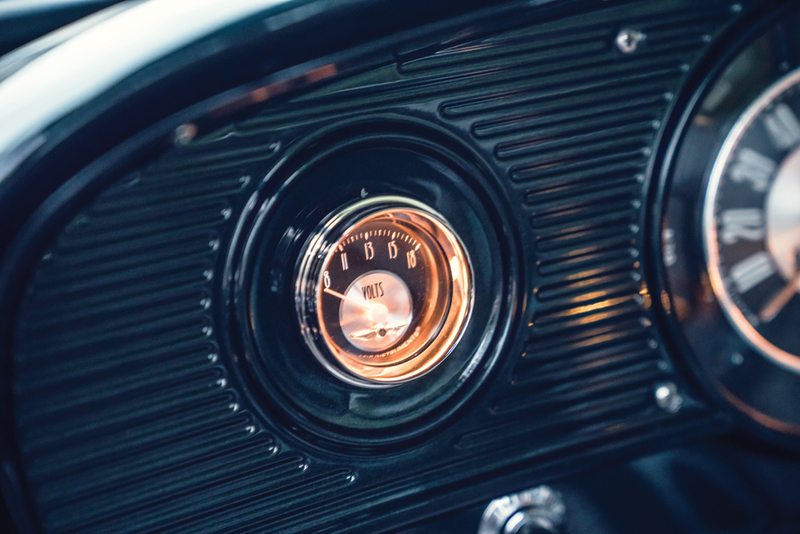 Only aftermarket voltage and oil pressure gauges were included in the cluster. 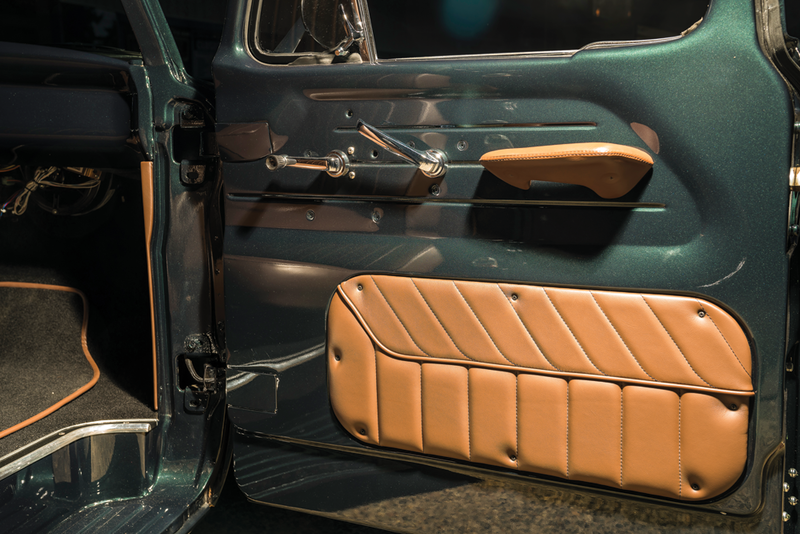 For creature comforts, the cabin features a custom center console with twin cupholders. 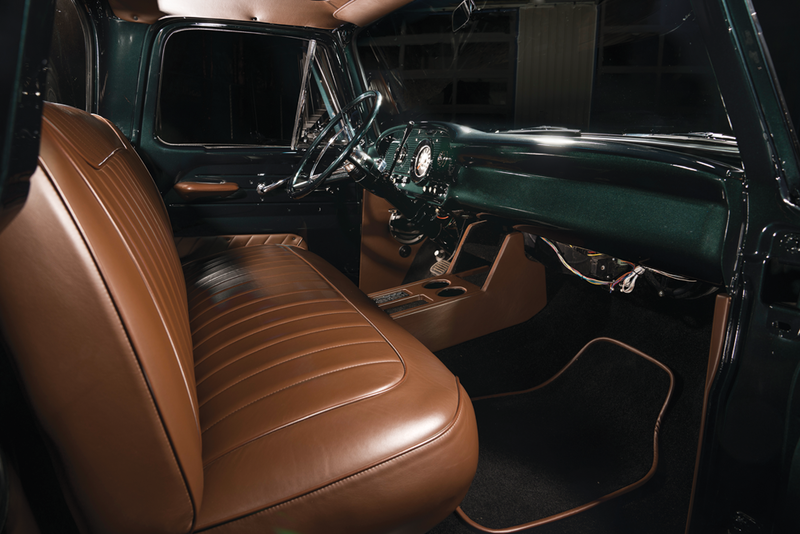 The bench seat was refitted with Italian leather, custom stitched by a local interior shop. A minimalist, modern audio system hides in plain sight. Hertz Components comprise the main speakers as well as dual 10-inch subwoofers; these are assisted by a JL Audio five-channel Bluetooth amplifier paired to Trevor’s iPhone, which serves as the primary head unit. Finally, the cabin is kept cool with a bolt-on A/C system from Vintage Air. In all honesty, the Monster Merc is anything but monstrous. Its brilliant green exterior highlights the handmade body mods. The frame-laying stance is impressive and in-your-face without being over-the-top. 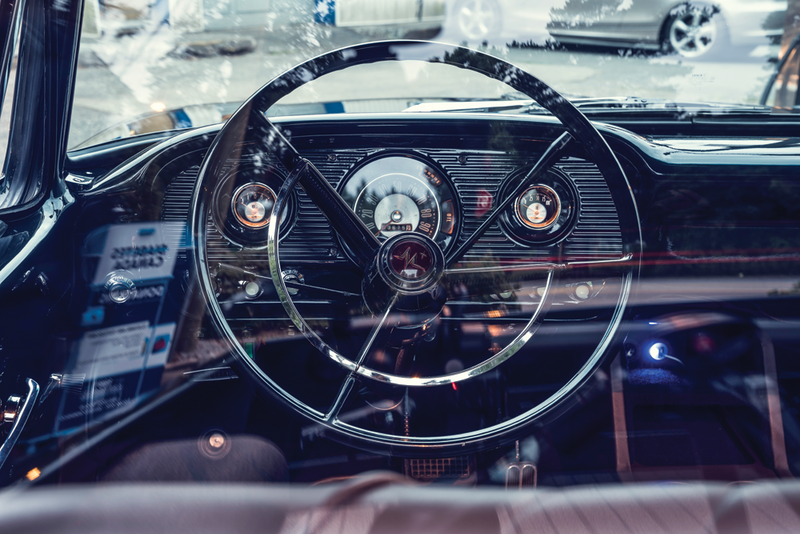 The simple interior makes daily driving comfortable and enjoyable, and all of this is undergirded by a collection of working Ford Motor Co. history. Trevor and his Monster Merc are a perfect match. Following his vision and blazing his own trail allowed him to make it so. Previous ArticleNEW PARTS COUNTER! Hot products for your ride!